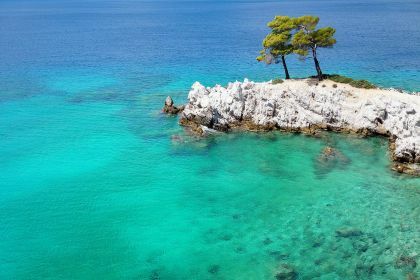 Known as the greenest island in the Aegean Sea, Skopelos is an authentic Greek destination which combines unspoilt nature, mountainous interiors, top-notch food and quiet beaches. Its beauty – pine forests, vineyards, olive groves and stunning architecture – was captured in the film Mama Mia. Call us or get in touch with your friendly Abberley yacht charter broker here and our seasoned team will take care of everything you need to turn your next yachting holiday into an idyllic vacation. Accessing the island is not the easiest – unless you come by yacht! 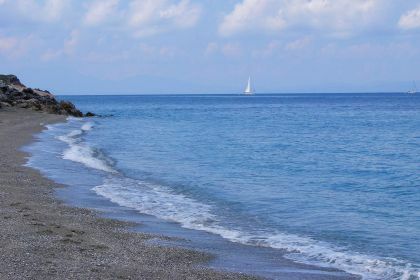 There is no airport and the quickest way to get here by air is via neighbouring Skiathos, from where an hour-long ferry delivers visitors to Skopelos Town. Being aboard your own yacht therefore gives you the pick of the island’s many coves and secret beaches. For privacy and solitude, sail north and drop anchor at the beaches of Hovolo, Ftelia and Neraki, which are inaccessible to cars and subsequently quiet. Anchor off Megalo Pefko, arguably the most beautiful and private beach on the island where swimming in the clear, azure water is a magical experience landlubbers seldom experience. 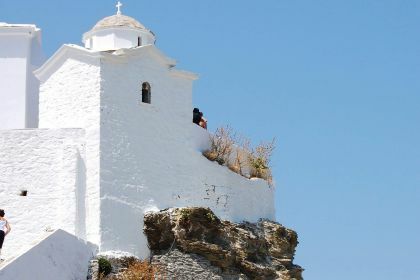 Skopelos also has many intriguing monasteries, often perched on cliff tops or at the edge of peninsulas. One of the finest, Evangelismos, stands on Mount Palouki, opposite Skopelos Town. Built in the 18th century, is has spectacular views of the town and bay and houses a vast array of artefacts and heirlooms. If you feel like a change of transport, hire a bicycle and pedal along the island’s numerous paths, inhaling the scent of herbs and almond trees. 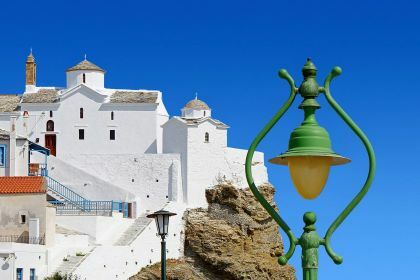 For a dash of culture, the Vakratsa House Museum, in the heart of Skopelos Town, has a great art collection showcasing various influences, from art deco to Venetian. Skopelos is known for its almond orchards and this local ingredient finds its way into a variety of mouth-watering dishes at any local taverna. If you’re after something savoury, head to Aramis Snack Café in Loutraki and try the island’s unique cheese pies – coils of fried pastry packed with goat’s cheese. At Agnanti restaurant, in Glossa old town, tuck into delectable contemporary Greek cuisine, such as octopus and herb fritters, while gazing out at the sparkling bay. With its plant-fringed courtyard and soft fairy lights, Olivo restaurant, tucked away near the Skopelos port, is a perfect place for a romantic dinner. Don’t forget to try the chocolate soup for dessert! Tiny Café Bar Thalassa, perched high above Skopelos town, has some of the best views – and smoothies – on the island. Looking for some night action? Sip a signature cocktail at Mercurius bar or head to Platanos Jazz Bar, where the music is as chilled as the drinks. With its pretty outside area, blue furniture and eclectic mix of tracks, Oionos Blue is also a fantastic spot. 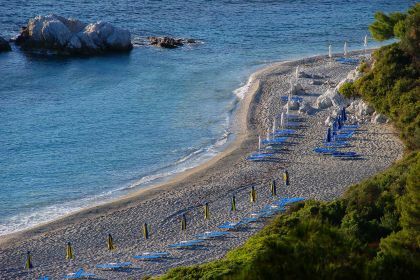 Ready to dive into the beauty of lush Skopelos? Our friendly broker will take care of every detail. 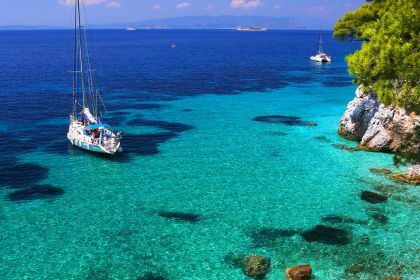 Call us or leave a message using the contact form to start planning your perfect sailing or motor yacht vacation in Greece. Insider Tip: If you’re planning to visit the Agios Ionnis chapel, featured in the movie Mama Mia, make sure you wear good walking shoes and are reasonably fit. The 300-odd steps can be a killer! Call us or leave your charter enquiry here and we will respond promptly.